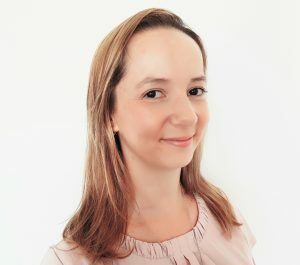 What are CNTs and what are their benefits? Carbon nanotubes (CNTs) are rolled up graphene layers which are only one atom layer thin. CNTs are only several nanometer thin, but show a length to diameter ratio of at least 150. This allows for some extraordinary properties. The pure carbon structure of CNTs results in high electrical and thermal conductivity which is at least 10 times as high as of copper. In addition, the high length to diameter ration of CNTs provides high mechanical strength (100 time stronger than steel at one sixth of the weight). What are challenges of CNT and where does LANXESS add value? The outstanding properties of CNTs come with a challenge: During the production process CNTs form agglomerates which prevent them from being used in industrial scale. This is exactly where LANXESS adds value. We have developed a process to exfoliate the agglomerates into single and stable CNTs. This way the CNTs unfold their full benefits in our customers’ applications. What are LANXESS products and their application? 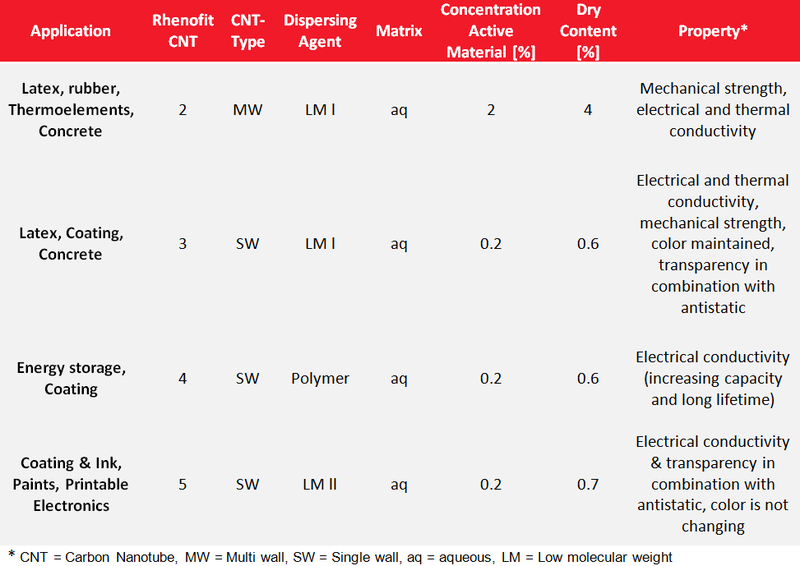 LANXESS has developed a broad range of aqueous CNT dispersions. This product range is called Rhenofit® CNT and offers the following advantages to our customers. There are many possibilities to use Rhenofit® CNT products. The most prominent areas are composites & latex, energy storage, construction & living, and coating & paints. The demand for high-performance materials is rising due to new regulation and higher industry standards. CNTs help to take the lead in this development as they are used in a variety of polymers and rubbers to achieve mechanical strength, antistatic properties, and thermal conductivity. Example: New regulation requires latex gloves to be antistatic. With Rhenofit® CNT it is possible to achieve this quality while at the same time choose any desired color. New energy concepts such as e-mobility urge us to rethink and reinvent energy storage systems. CNTs used as electrode material in lithium ion batteries help to increase capacities and charging cycles. The increasing demand for light high-performance construction materials offers a variety of applications for CNTs. For example Rhenofit® CNT enhances the mechanical properties of concrete and sheetrocks. As CNTs improve both conductivity and mechanical properties there are many applications for Rhenofit® CNT – for example in antistatic coatings. In addition, with Rhenofit® CNT it is possible to achieve antistatic properties while keeping the transparency of the coating. What makes CNTs so special and what material improvements do they provide? CNTs consist of pure carbon and have a graphene-like structure. The extraordinary properties of CNTs are very high thermal and electrical conductivity. And because the tubes are one dimensional rods with a diameter of several nanometer, the cylindrical shaped form has a very high aspect ratio from a length to diameter ratio of at least >150. This is the reason for the extreme mechanical strength of the tubes. In addition, thermal and electrical conductivity as well as mechanical strength can be achieved at low CNT concentrations. What is the challenge with the industrial usage of Carbon Nanotubes? During the production process of CNTs the material gets entangled and the tubes create agglomerates. This prevents the transfer of the properties to the application. This is exactly where LANXESS provides a solution. We have developed a process to disperse these agglomerates in way that guarantees both intactness of the tubes and full transfer of the properies to the application. Is the supply chain for Rhenofit® CNT safe and consistent? There are many suppliers on the market that offer CNT dispersion. However, most of them lack the ability to supply their products at an industry standard. Their production is either too small and inconsistent or they are bound to only one CNT producer. LANXESS in contrast is not bound to one individual CNT supplier. Therefore, we can supply a wide product range while increasing raw material security. In addition, our global setup allows us to produce and supply Rhenofit® CNT worldwide on industrial scale. What are the differences between the Rhenofit® CNT products ? Today the commercial products are available with two different Carbon Nanomaterials, which are Multi-Wall and Single-Wall CNTs. One major difference is, that the dispersions based on Single-Wall CNTs can be used for applications where transparency is required, the general usability is described in the application section. Dispersing agents range from polymer to low molecular weight salts. The flexible production process allows us to continuously increase the number of used agents based on customer requirements. The degree of exfoliation is driven by the intended application and is optimized on experiences during the last years. Do you have general guidelines for the usage of Rhenofit® CNT? The general guidelines for the usage of Rhenofit® CNT are mentioned in the TDS, please follow the instructions mentioned there. We are happy to share our knowledge on the use of the CNT dispersions. Please do not hesitate to contact us. We are happy to help. If you have any questions regarding our products and services, please do not hesitate to contact us! Call us on +49 (0)621-8907-422, send us a mail to Bruna.Calza@lanxess.com or fill in the contact form! LANXESS is a leading specialty chemicals company with sales of EUR 7.7 billion in 2016 and about 19,200 employees in 25 countries. The company is currently represented at 74 production sites worldwide.